Labour leader Jeremy Corbyn has accused the UK Government of a "power grab" over key Brexit legislation. His stance contradicts Welsh Labour ministers, who have reached a deal on the issue. "What they are doing is taking powers from Brussels that then ought to go to Scotland, Wales and English regions and instead hoarding them in Whitehall," Mr Corbyn said. Plaid Cymru said the Welsh Government's position was "ludicrous". After a long-running row over what should happen to powers in devolved areas returning to Britain post-Brexit, the Welsh and UK governments reached an agreement last month. However the Scottish SNP government - with the backing of the Scottish Labour Party - has continued to reject the deal on offer. On Tuesday, Welsh AMs are expected to give their legislative consent to the EU Withdrawal Bill, in contrast to the Scottish Parliament. Plaid Cymru is the only party in the assembly expected to withhold its consent - it has accused Welsh Government ministers of selling Wales "down the river". 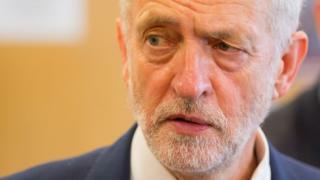 Speaking on a visit to Glasgow on Friday, Mr Corbyn said: "I'm very happy that the Scottish Labour Party will be voting against the legislative consent proposal next week because, quite clearly, there is a power grab going on by Whitehall on the EU withdrawal. "That is unacceptable to us and we have made that very clear." "We are a party of devolution. Therefore, devolution sometimes throws up interesting answers. "I'm quite happy about that because that is what devolution is about, people making their own decisions. "But as far as I'm concerned there should be the maximum devolution from the EU withdrawal to Scotland, Wales and the English regions." A spokesman for Finance Secretary Mark Drakeford said: "Through careful and persistent negotiations, we have secured a huge shift from the UK Government from its initial hard-line stance to one that is fair and works for Wales. "In Wales, we are in government with all the responsibilities that brings. The agreement we have reached is both responsible and effective in protecting devolution in Wales." Image caption Leanne Wood said the Welsh Government's position was "ludicrous"
Plaid Cymru leader Leanne Wood said: "The Labour Welsh Government is now in the ludicrous position of being the only branch of their own party that supports the Withdrawal Bill, in the only place where Labour is in government and can stop this power grab, they have chosen to endorse it. "People in Wales voted for devolution and now Labour in Wales is working with the Tories to undermine it. "It is embarrassing and absurd in equal measure that Labour in Wales still refuses to recognise the damage the Withdrawal Bill will do to our nation. "Now that their London leader has said that it is right to reject the Westminster power grab, the Labour Welsh Government must urgently reconsider their position." Ms Wood wrote to Mr Corbyn, asking him to "impress your concerns upon the Labour Welsh Government, whose views on devolution and the power grab clearly differ so greatly from your own".